Besøg Salt Cathedral of Zipaquirá og Lake Guatavita på denne to-i-en dagsudflugt fra Bogotá. 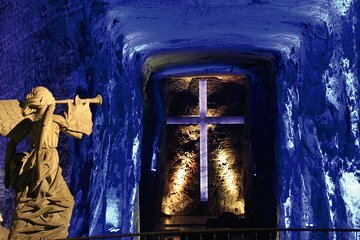 For det første udforske salerne i Salt Cathedral, den eneste underjordiske katolske kirke i verden. Så våg i Guatavitas naturpark for at lære om den kulturelle betydning af søen samt legenden om El Dorado. The tour was to begin at 9 in the morning. The front desk of our hotel were called the night before to tell us to be ready for pick up by 8AM. Around 9:20 we had not been picked up so we called the tour operator and he told us we would be picked up by 10. He finally showed up at 10:45 and he still had 2 other stops to make before the tour actually started. We arrived at the Salt Cathedral around 1 in the afternoon and it was here that the guide told us that we would not be going to Lake Guatavita. He told us that he had been notified that morning that the Lake Guatavita part of our tour had been cancelled. He said that the park was temporarily closed. That was the part of the tour that we were really looking forward to seeing. The tour company obviously knew this before that morning yet did not bother to tell us ahead of time. We also spent almost 3 hours in the hotel lobby and on the side walk waiting to be picked up. We ended up using a whole day for a half day tour and we were extremely upset by the 3 wait to be picked up. We also maybe could have changed the day for the lake tour if we were notified ahead of time. It was not a good day!